This monkey cake is a Red velvet injected with a french vanilla mousse. The Lady who ordered this cake did not like cream cheese, so the icing was a whipped vanilla icing. I then airbrushed the background to make it look like the grass then the sky. 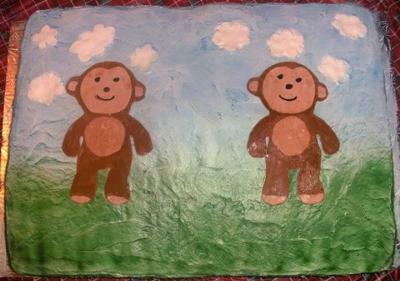 The Monkey's are made out of MM Fondant (banana flavored)also the same for the sky. The corn starch takes away some of the sweetness without interfering with the flavor. Join in and write your own page! It's easy to do. How? Simply click here to return to Monkey Cake.